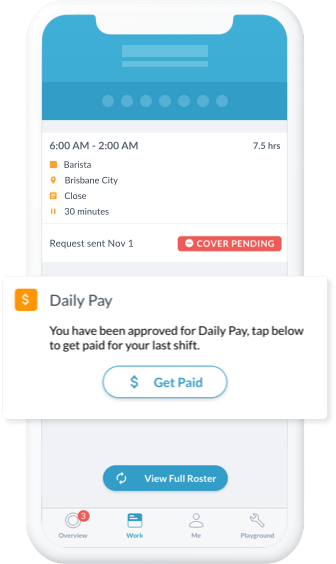 Get paid immediately at the end of your shift! At the end of your shift each day, we will send you an email or a text message, asking if you would like to advance a part of your wage for the day. Once confirmed, we will deposit your advance into your bank account via your PayId, so that it appears straight away. On payday, we will automatically debit the amount you loaned + a $2 fee from the bank account your pay goes into. No, this isn't a loan. There is no interest. You are simply accessing your own pay early. As soon as your salary hits your bank account, a direct debit will be fired off to repay the money. Can I ever lend more than I earn in the week? No, we make sure that you aren’t advancing more than your weekly salary. When you start using TandaPay you will not be able to access more than 75% of your pay at most. This is to avoid you advancing more than you earn after taxes and to ensure you are able to return the money without financial stress. Does this cost my employer anything? No, this won’t cost them anything, as it is completely handled between you and Tanda. Ready to start getting paid daily? Set up your payment details now!